Headline: Her love has no blackout dates. 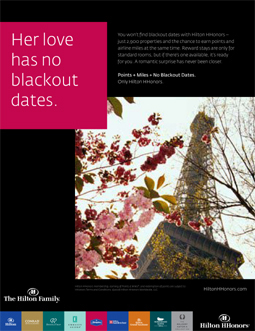 You won't find blackout dates with Hilton HHonors -- just 2,900 properties and the chance to earn points and airline miles at the same time. Reward stays are only for standard rooms, but if there's one available, it's ready for you. A romantic surprise has never been closer. Points + Miles + No Blackout Dates.